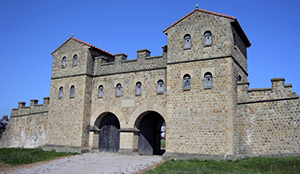 A fascinating fort in its own right Arbeia lies opposite Tynemouth on the southern side of the mouth of the Tyne in South Shields. Its name means ‘Place of the Arabs’ and probably comes from the unit of Tigris Boatmen from Arabia stationed here in the fourth century. It has had an extensive history with many twists and turns and this is not the original fort for the area. Apparently a civilian settlement developed outside a fort which lies beyond the currently excavated site and has yet to be discovered. These civilian buildings date to about 125 AD. Two periods of building are noted and the second period is associated with a small parade ground which measured 30m x 35m. The current fort was built at around 158 AD after Hadrian’s Wall was re-occupied after the campaigns further north in Scotland which saw the construction of the Antonine Wall. Like Segedunum this was manned by 480 infantry soldiers and 120 cavalry and the area the fort covered was 4.1 acres. Since that time and up to the period at the end of Roman occupation the fort underwent many changes. Some were obviously planned, and some not, like the burning down of the fort in the late third or early fourth centuries after being attacked. The fort continued to be used even after the Romans left and was certainly being utilised well into the Anglo-Saxon period. The fort then fell into disuse. In the early third century the fort underwent huge change in that the south rampart was removed and rebuilt further outside the fort thus enlarging the internal area of the fort. This then allowed for the building of 22 granaries which forced the further rebuild of the headquarters building away from its central point and on a smaller scale. All this is thought to have been done for the incursion into Scotland by Severus as supplies and storage of the same would need to increase in capacity. 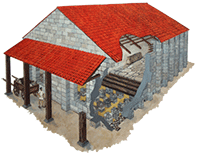 Severus died in 211 AD and the building of granaries continued, possibly, up to 230 AD. This then makes the fort act as a supply base for the troops on Hadrian’s Wall itself after the withdrawal from Scotland and the Antonine Wall. Near the turn of the third and fourth centuries the fort burnt down and its use returned back to the more usual type. The headquarters building, for example, returned to where the original would have stood. The name Arbeia is noted for the first time in the Notitia Dignitatum and is written thus: Praefectus numeri barcariorum Tigrisiensium Arbeia. The meaning of which is: The Commanding Officer of the Unit of Tigris Boatmen at Arbeia. may have lookedThese boatmen were recruited from an area along the River Tigris known as ‘Bet Arbaye’, the translation of which means: Home of the Arabs. 1st_Note The tombstone of a freedman of a trooper of the ala I Astorum (RIB 1064) still presents problems. A tile stamp (Ephemeris Epigraphica 3, 202) of ala I Pannoniorum Sabiana does not prove that he regiment was ever at South Shields.